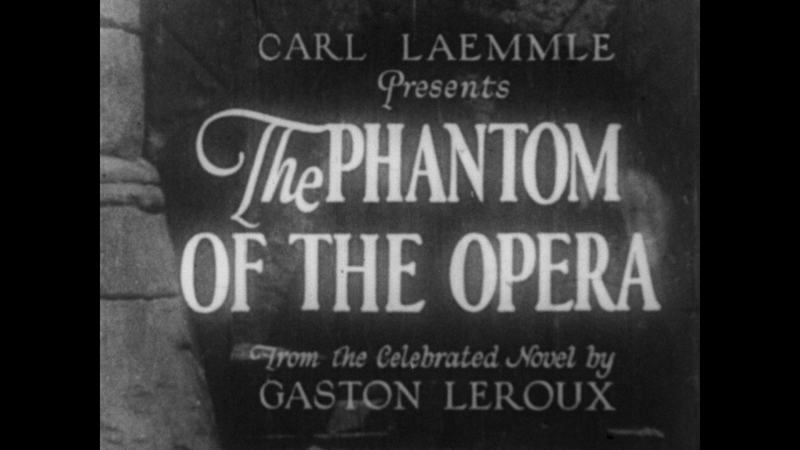 As its name implies, this was a rough cut of Phantom of the Opera shown to test audiences in Los Angeles on January 7 and 26, 1925. At this point, the direction was totally credited to Rupert Julian. The critical and audience response was largely negative, and led to substantial changes. The ending is the closest to the book, as the Phantom is shown to die of a broken heart. An alternate ending where the Persian shoots the Phantom in his lair was shot and may also have been shown in some screenings of this version. Only this version also includes a scene at the Graveyard and Madame Valerius, both of which were in the novel by Gaston Leroux. Also like in the novel, Christine tells Raoul of her unmasking of the Phantom in flashback as they talk on the Opera Roof. At this point, Arthur Edmund Carewe's character is The Persian, just like in Leroux' book, and the Phantom's backstory is consistent with the one given in the book. This version was long enough at 22 reels to have an Intermission. 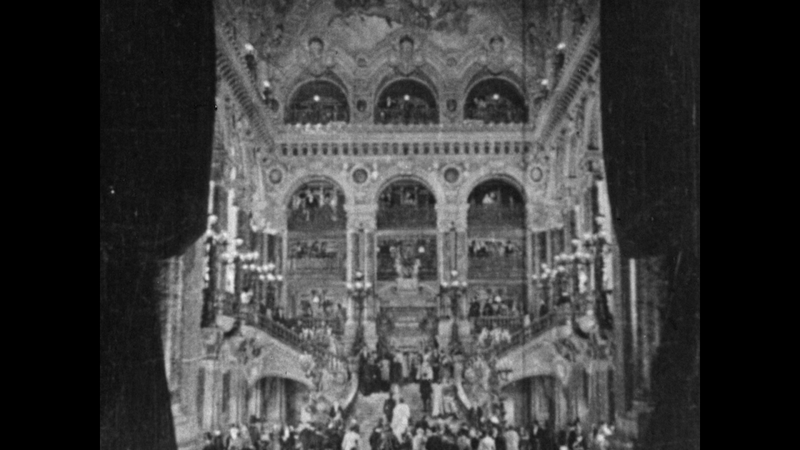 This was the second version of Phantom of the Opera shown to the public, in this case at the Curran Theater in San Francisco for a four week engagement from April 26 into May 23, 1925. This version includes newly-shot scenes directed by Edward Sedgewick. It too suffered a critical drubbing and audience apathy, and again the film was sent back for further editing. This version includes a newly-shot substantial subplot with Raoul and a Count Ruboff, played by Ward Crane, competing for Christine's affections, leading up to a duel. Added for mostly comic relief were Chester Conklin as Raoul's valet and Viola Vale as Christine's maid. The subplot occurs outside and separate from the happenings at the Opera and has been criticized as being cliched. 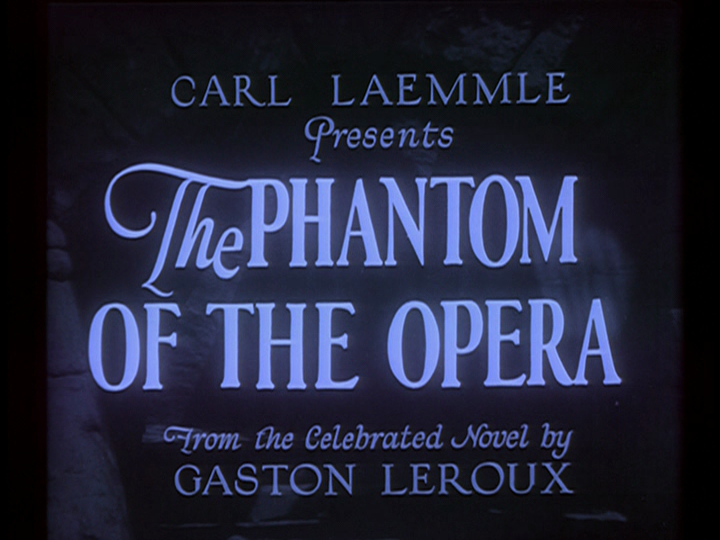 The film's ending where the Phantom tries to escape the mob by carriage and is beaten and thrown into the Seine was shot by Sedgewick and first appears in this version. This and all subsequent versions could come in at 10 reels. The third time was the charm for the Phantom, this version premiered at the Astor Theater in New York City on September 6, 1925 and shown well into 1926 across the United States. All of the material directed by Sedgewick for the San Francisco version was eliminated except for the new ending. At this stage, The Persian has become Inspector Ledoux of the Secret Police and the Phantom is a madman escaped from Devil's Island. Also, this version has the famously inept shot of Norman Kerry playing with his gloves as the he is eavesdropping on Phantom talking to Christine behind the wall. To the extent that any of the versions from 1925 have survived, this is the version that still exists in some substantial form (see part II-B, below). 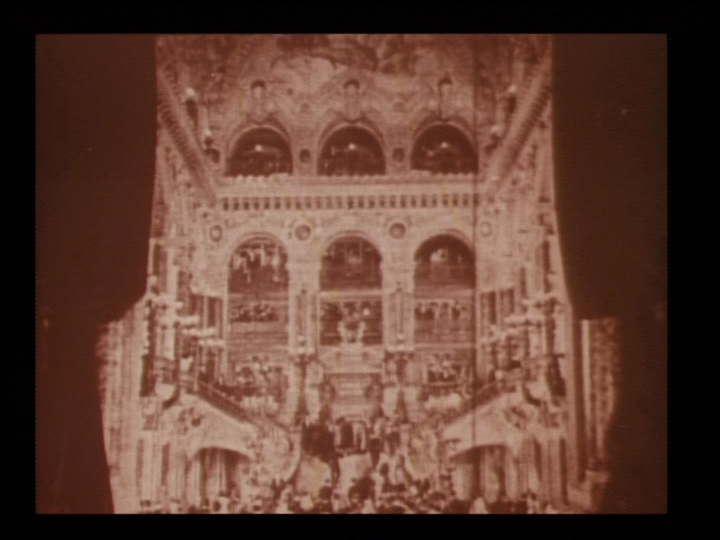 This version was reported to contain sequences of the Opera stage and stairwell, including the Bal Masque, in Prizma color and Process 2 Technicolor. It also uses the Handschliegl process for at least the Phantom's cape when he spies on Raoul and Christine on the roof of the opera. 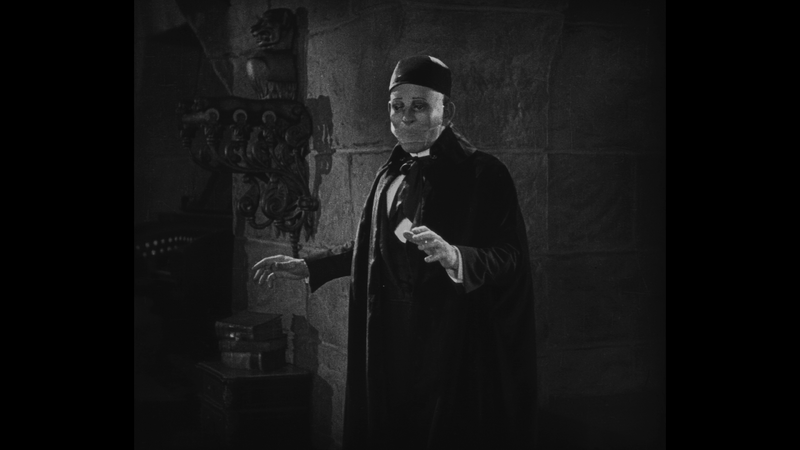 Four years after the last footage had been shot for the silent versions of the Phantom of the Opera, Universal decided to make reissue it as a partial talkie. To do this, they reengaged Mary Philbin and Norman Kerry and some of the other original actors and some new actors to shoot new sound sequences that would be edited with the silent footage. Carlotta was now played by Mary Fabian, who could sing, and her mother was played by Fay Holderness for the talking scenes with the managers. Edward Martindel replaced John Sainpolis as Phillipe de Chagny except in a few long shots, and These sequences were directed in 1929 by Ernst Laemmle. Lon Chaney was under contract to MGM and Universal could not dub his voice. To get around this problem, they had another actor act as the Phantom's servant for those scenes where the Phantom talks to other people behind a wall or mirror. 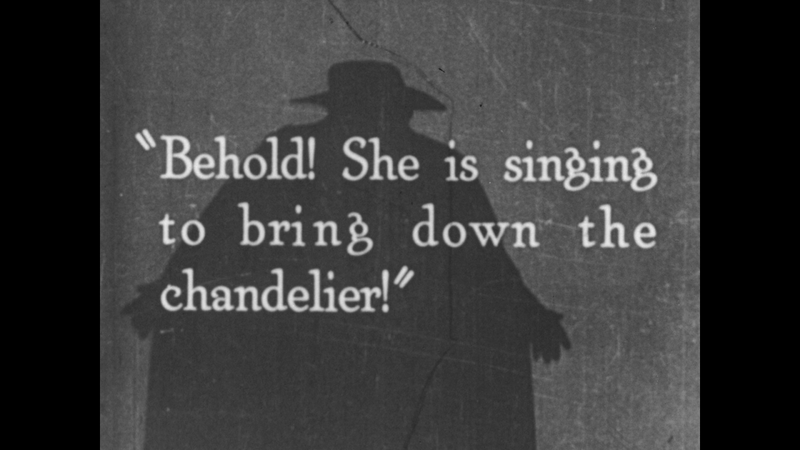 Once the Phantom as portrayed by Lon Chaney appears in person to Christine, intertitles resume and his servant disappears. The servant was played by Phillips Smalley. This was first released in Dallas and Detroit on January 3, 1930, but is mostly lost (see II-E, below, regarding its survival). It came in 10 reels. The best visual quality representation of the film survives in a 35mm print struck by Universal at the request of James Card, first curator of the George Eastman House in 1950. This print runs to ten reels and is about 90 minutes at 20fps and 75 minutes when run at 24fps (sound speed). It is not tinted and has no technicolor sequences. It also is apparently cropped on the left side, probably because it was duplicated on machinery intended for sound film. 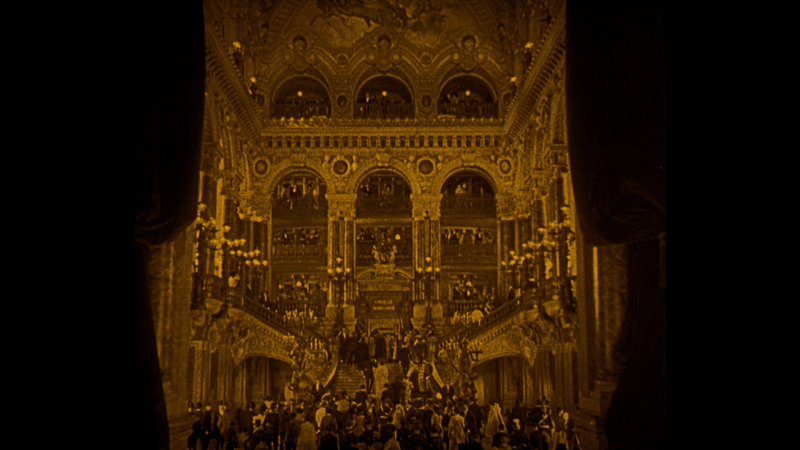 A sound negative in the Academy Ratio has the optical soundtrack running down the left side of the film. 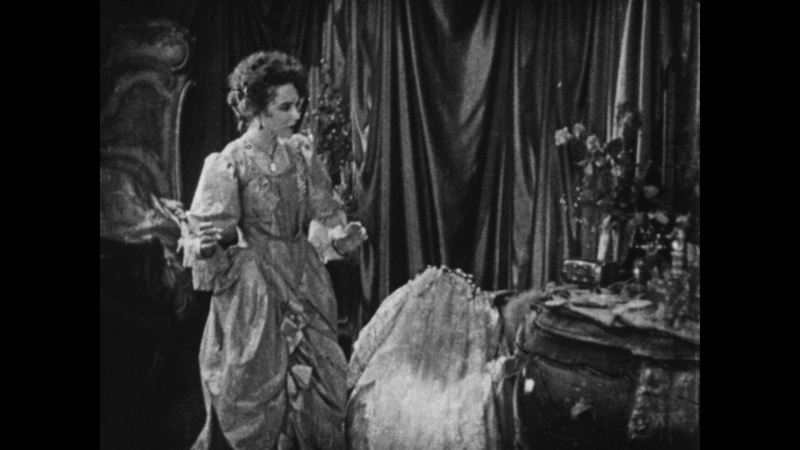 Although the original aspect ratio of the film is 1.33:1, due to the blocking on the left side of the image, the resulting Eastman Print has a Movietone aspect ratio close to 1.2:1. With sound film, the width of the film is the same but the left side of the film strip is taken up by the optical soundtrack. 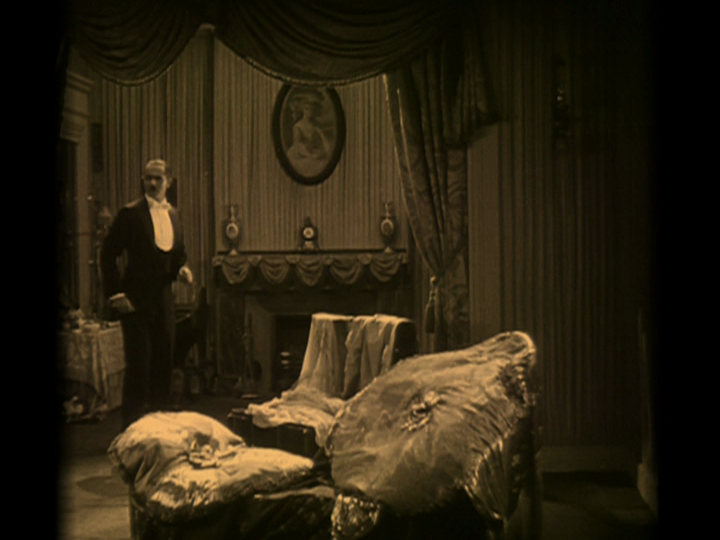 It has some moderate to severe mottling damage during the scene where Christine wakes up in her "bedroom" in the Phantom's lair. This Print was originally thought to be the Talkie Re-release, but it is not the case. Virtually all the footage in this print was shot in 1924-1925. 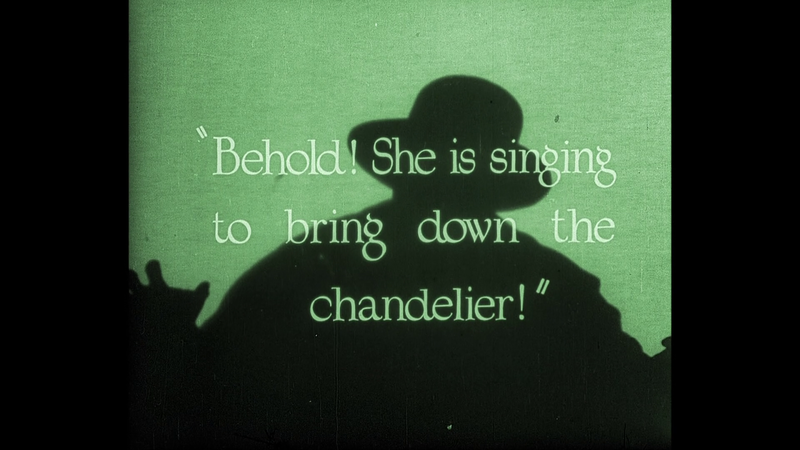 The opening titles for the Eastman Print are from the Talkie Re-release in 1929. 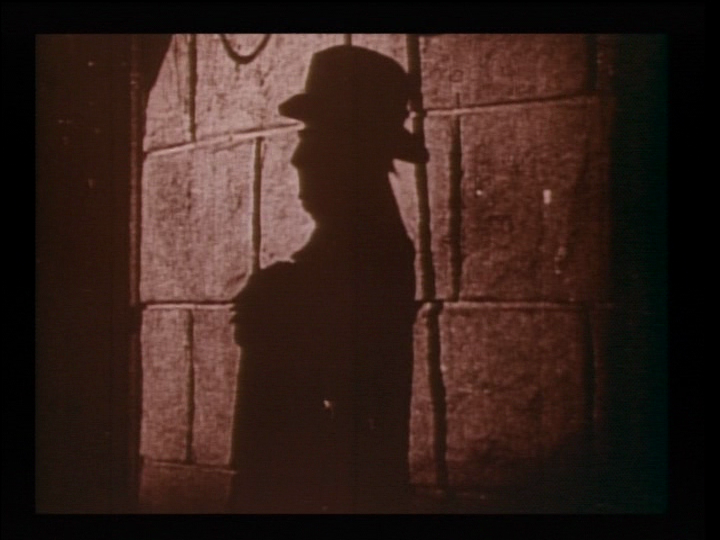 The "Phantom" skulking through the set during the titles is not Lon Chaney. The surviving sound discs for the Talkie Re-release do not synchronize with this footage except during Carlotta's signing from Faust. 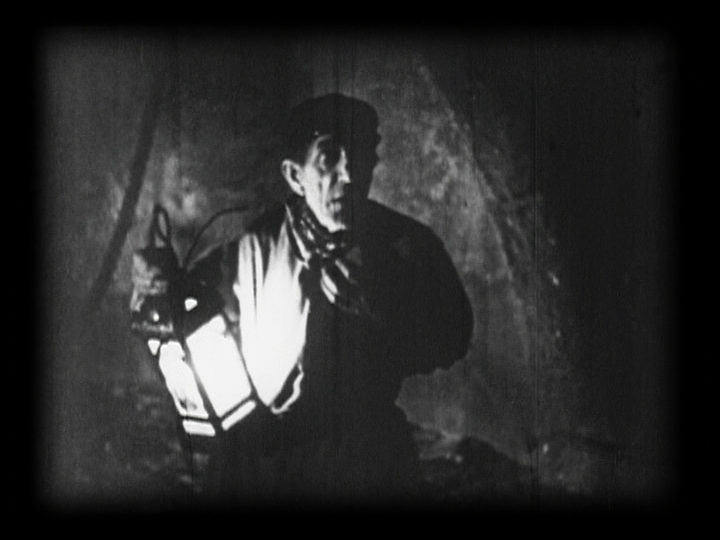 The Eastman Print contains a puzzling sequence at the beginning of the film where a man with a lantern is walking in the cellars of the opera and "talks" to the audience. 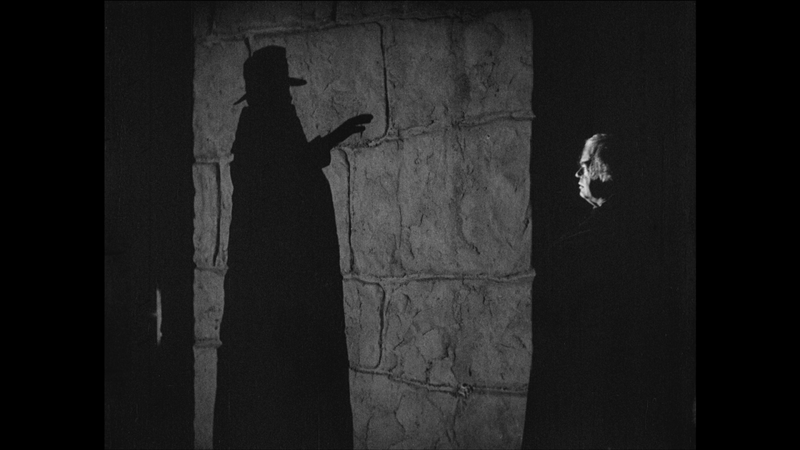 The Phantom in cape and hat also appears in this scene. The scene lasts for approximately one minute at sound speed are there are no intertitles. This caused film historian Scott MacQueen to believe that this sequence was shot so Universal could release the film internationally as a sound film. 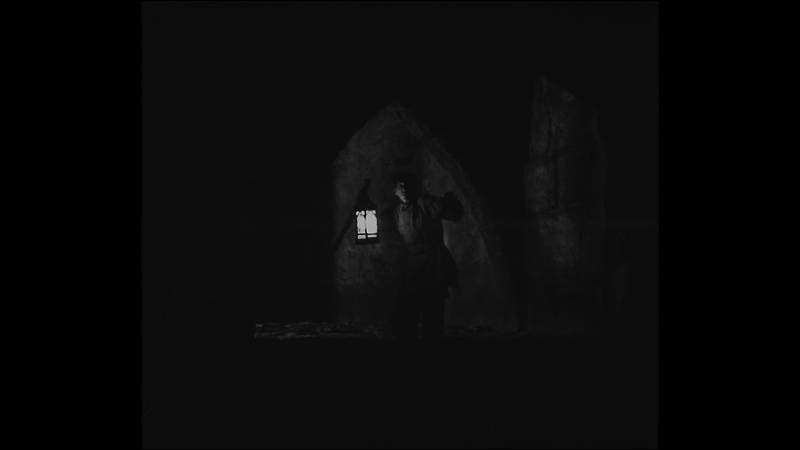 The Man with a Lantern could be attached to any foreign print speaking in the local language, and combined with the singing sequences, a foreign distributor could technically release it as a talking film. 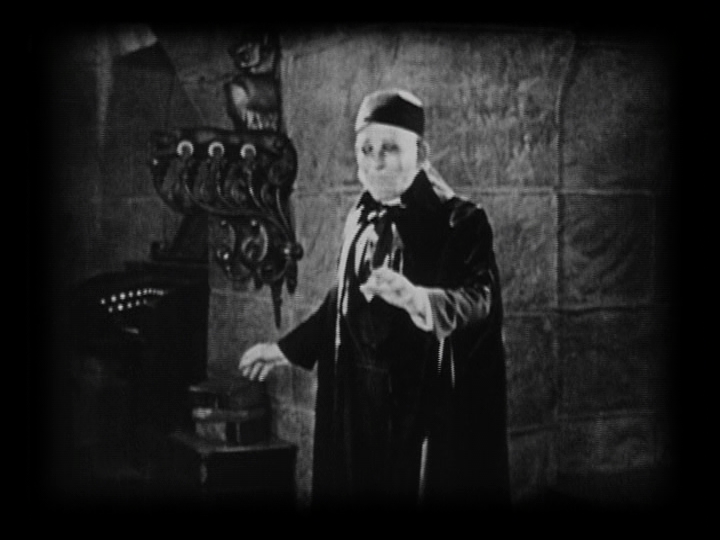 What he is saying has never been definitively established, but Phillip Riley in the Phantom of the Opera, Magic Image Filmbooks Series, Classic Silents - Volume 1, showed the sequence to a deaf person and a lip reader and one of them opined that the Man with a Lantern was speaking in German. The other person thought he could make out "Gaston Leroux". The other alternatives, albeit without any documentary support, is that this was a U.S. silent version of the Talkie Re-release for theaters that had not converted to sound or it was an internal reference print for Universal itself. No advertisements indicate that the Phantom was being offered for rental as a silent film in 1929-1930. 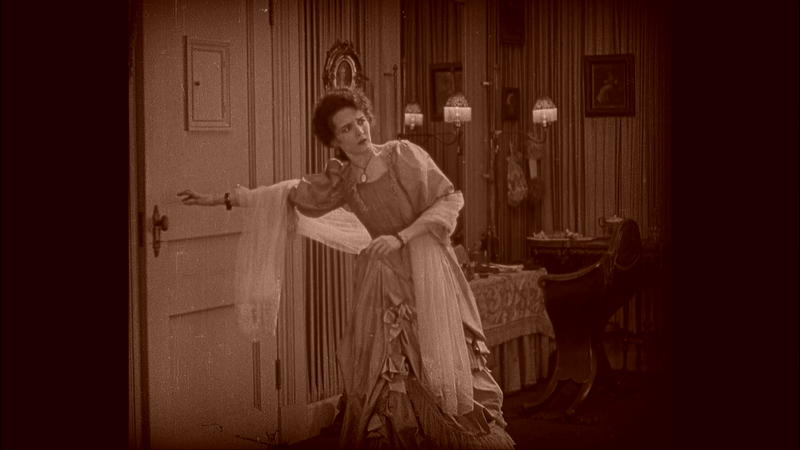 The actress who played Carlotta in 1925, Virginia Pearson, was redesignated as Carlotta's Mother in the Eastman Print. 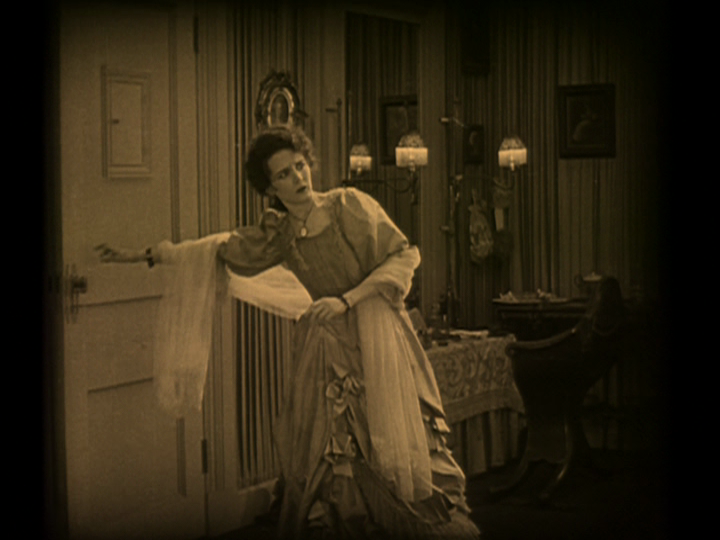 Carlotta was played by Mary Fabian, using footage shot for the Talkie Re-release. The opening credits give listings for both actresses, but the closing credits are from the General Release of 1925 and only list Virginia Pearson as Carlotta. The shots where Christine sings on the Opera Stage just before she is abducted by the Phantom is also from the Talkie Re-release. The notes and intertitles were also from the Talkie Re-release, although some new ones were necessary for the scenes which had talk but were silent in this print. The Eastman Print is a mix of mostly outakes and second camera takes shot in 1924-1925, B&W alternate takes of color footage and some Talkie Re-release footage. 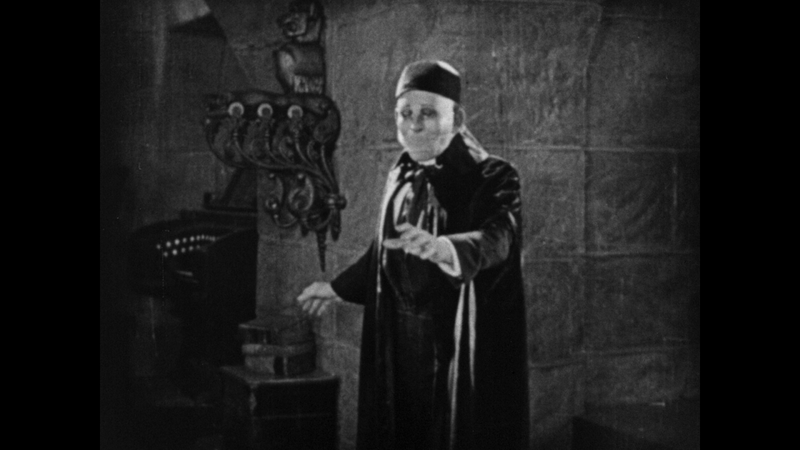 The only other near complete source for the Phantom of the Opera came from the collection of John Hampton, an early silent film preservationist who ran the Old Time Movie theater from 1940 to 1979. He showed only silent films at this theater which is still in operation and now known under new management as The Silent Theatre (and plays sound films as well, but all its silent films are played at sound speed). Back in the 1930s, Universal marketed 16mm reduction prints of some of their silent movies to the mass market. This is how 1923 film of The Hunchback of Notre Dame starring Lon Chaney survived. Hampton was able to collect some of these Show-at-Home prints to compile a mostly complete representation of the 1925 General Release of the film. According to one source, Hampton took the best elements of eight separate prints and spliced the best parts of each to make the print that is available today. Hampton's materials found their way to the Stanton Theater Foundation and are now stored at the UCLA Film and Television Archive. This version is not at the same level of quality as the Eastman print. Detail is softer, contrast is poorer and scratches abound. It is much longer at about 115 minutes when run at 20 frames per second. No tinting or color sequences are present on the film elements. When compared, The Hunchback of Notre Dame is has a better quality picture than Phantom as represented in the Hampton Print because it survives as a true Show-at-Home print and is fewer generations away from the negative. The releases of the Hampton Print currently available use scans of dupes from Hampton's prints. Hampton's original materials, which are stored at the UCLA Film and Television Archive, are superior to what is available but they have not been made generally available. UCLA announced a restoration of Hampton's original materials about fifteen years ago, but no progress has been made. While the Hampton Print is almost totally comprised of footage from the 1925 General Release, the title sequence is borrowed from the Talkie Re-release until the card "Produced in its entirety at Universal City, California." 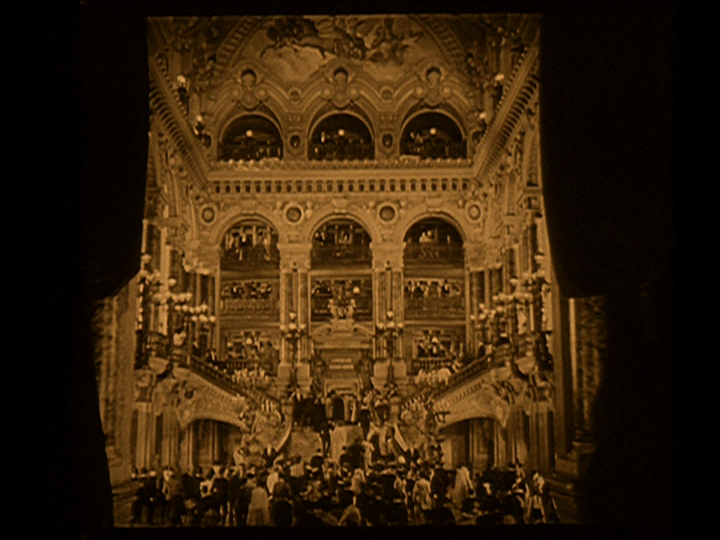 The Bal Masque footage seen in the print is from the B&W camera, not the Technicolor camera which the 1925 General Release Version used (see below). There is short sequence with the man with the lantern at the beginning of the Hampton Print, but it only lasts for about 13 seconds in this Print and included a medium shot of him not in the Eastman Print. The trailers for both the 1925 General Release and 1929 Talkie Re-release versions survive. The trailer for the Talkie Re-release is believed to contain much of the original title sequence for the 1925 film. If there was a sound disk (see section I-E., below) for this trailer then the disk has not survived. Ironically, the trailer for the 1925 General Release on most discs uses the title sequence from the 1929 Talkie Re-release. 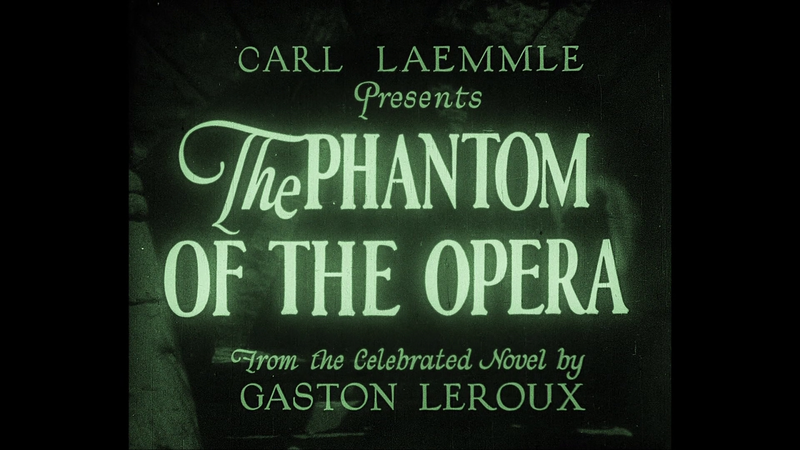 The surviving trailer film for the 1925 General Release should probably have begun with the Phantom shown over the Opera house with the names of the principal stars. Also, all the footage shown in the Talkie Re-release trailer was shot in 1924-25, no actual footage shot in 1929 was used. The trailers contain some footage not seen in the Eastman or Hampton prints. For example, the trailers show the Phantom riding up the counterweight of the pulley mechanism that controls the mirror, which gives a more convincing explanation why Christine does not see him at first. It is easy to see why this was cut, however. With that shot, the impact of seeing the Phantom as masked is diminished. 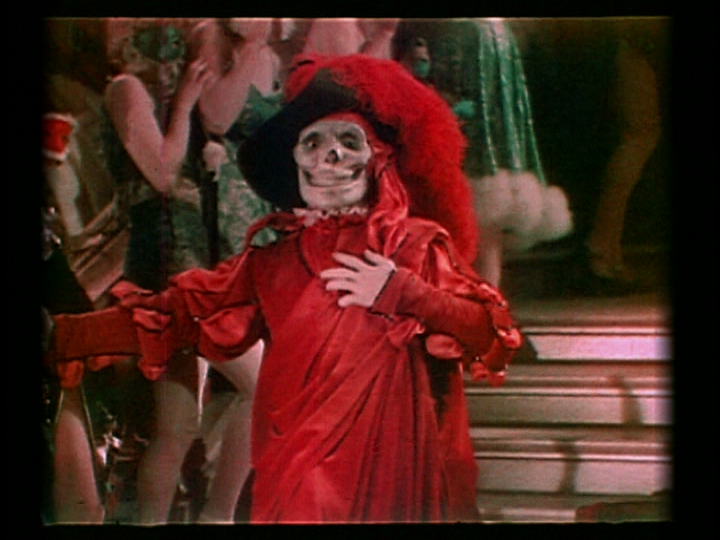 In the 1970s, Film Archivist David Shepard, working for Blackhawk Films, discovered a sequence in two-strip Technicolor of the opening scenes at the Bal Masque. This film runs from the intertitle introducing the Bal Masque to the point when Christine and Raoul go onto the roof. 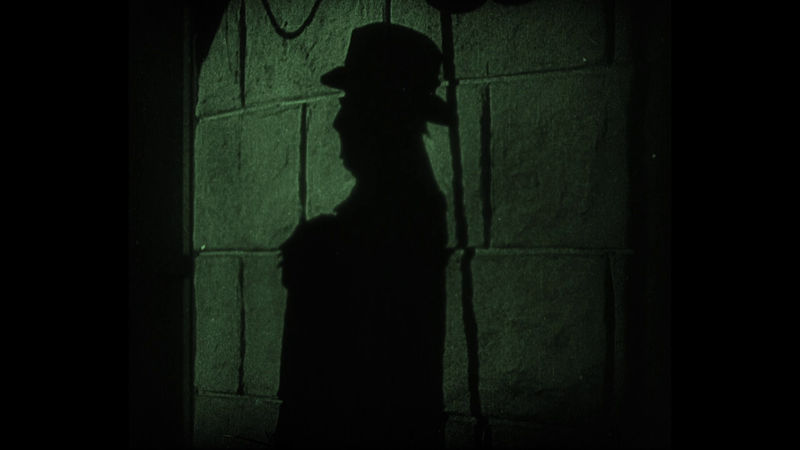 The sequence was shot with Technicolor equipment and is different visually from the same sequence in the Eastman Print, shot using the B&W cameras. Two subsequent sequences, the first being Christine and Raoul descending from the roof and Florine encountering the Red Death have not been located but do exist in the Eastman Print in B&W. The Eastman Print uses 1929 Talkie Re-release style intertitles and B&W footage. 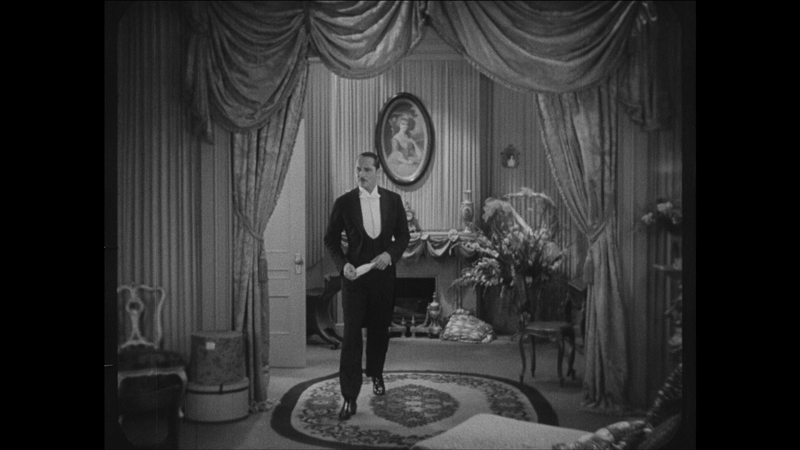 The Hampton Print also uses the B&W footage, but the intertitles have a curtain-style background. 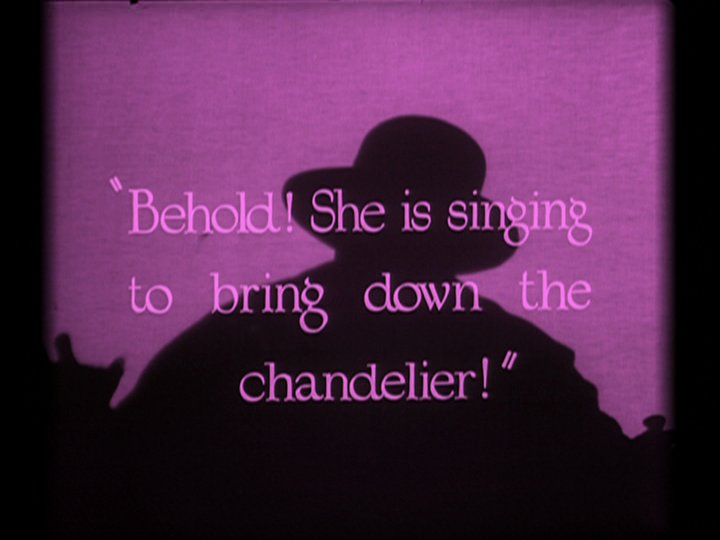 The Technicolor footage uses a third set of intertitles, in color with a different typeface from the first two and a different curtain image. Essentially there are three surviving versions of this sequence : Eastman B&W, Hampton Technicolor-to-B&W & Shepard Technicolor. The 1929 Talkie Re-Release does not survive in its entirety. It had a Vitaphone soundtrack where the sound was stored on vinyl records or discs synchronized to the film projector. The 1929 Talkie Re-Release came on 10 reels and the ten accompanying sound disks survive. Of the film itself, only Reel 5 has been found and is currently stored in the Library of Congress, as are the sound disks. The reel is missing some footage, but Christine and Raoul have aged, especially the former. 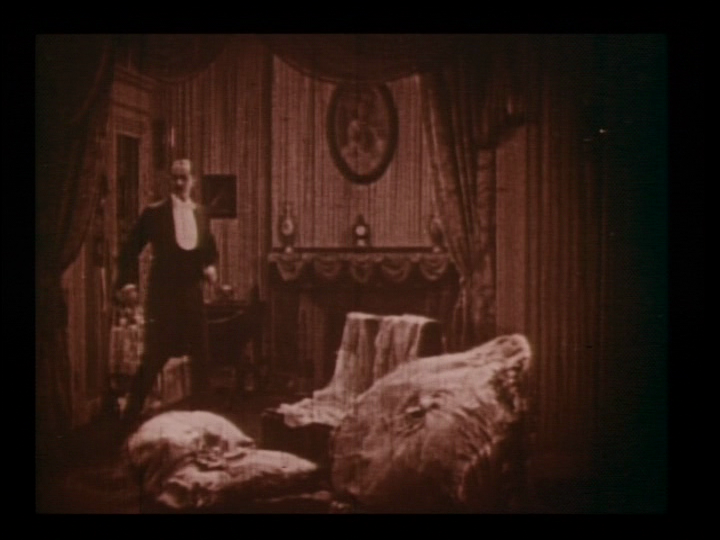 The Phantom's servant is visible in the newly-discovered Reel 5. 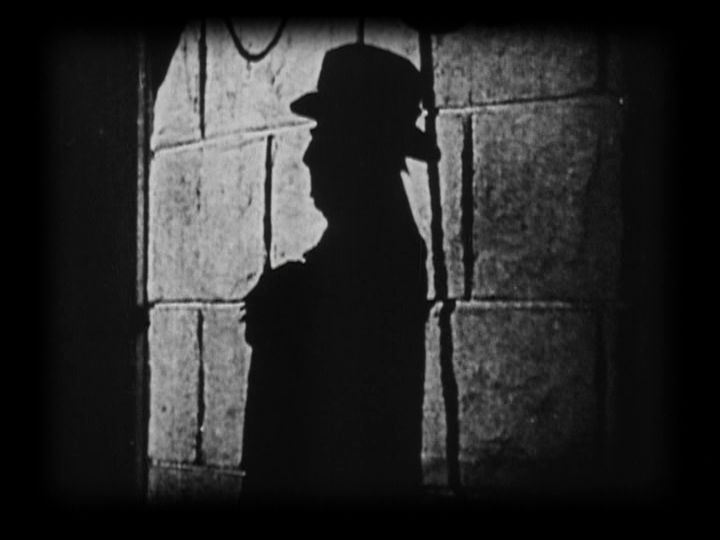 Overall, there is about 1 minute and 15 seconds of new footage showing Christine and the Phantom's servant shot in 1929 and about 12 seconds of Raoul in footage shot in 1929 from this reel. Scene 7 - Manager's Office: Carlotta's Mother tells the Managers that her daughter will sign in Faust. Scene 8 - Christine's Dressing Room: The Master's servant tells Christine to come through the mirror. The film for this scene has been mostly recovered. 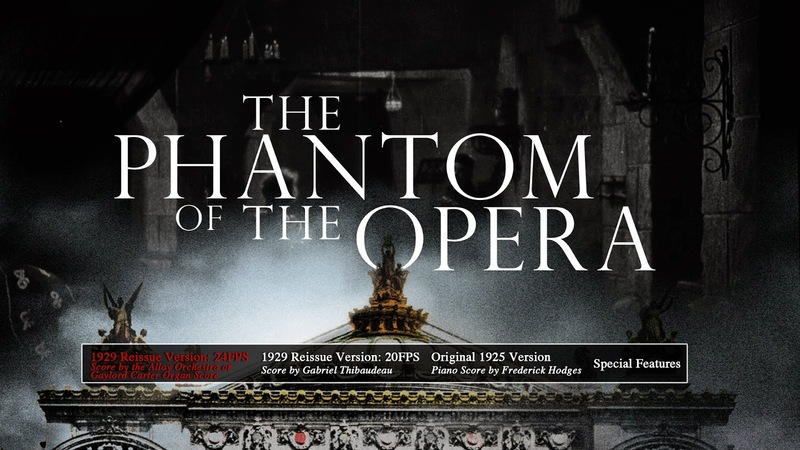 As the Phantom of the Opera is in the public domain in its raw format, anyone can scan the film and release it on some kind of home video format. There have been cheap VHS and DVD copies found in bargain bins for years. The cheapest releases are usually from an ancient transfer of the Eastman Print, sometimes a 16mm reduction print or derived from the Hampton Print. All quality releases (with one exception) since the first Laserdisc in 1990 have two pedigrees. The first is from David Shepard, Blackhawk Films and Film Associates. The second is from Kevin Brownlow and Photoplay Productions. 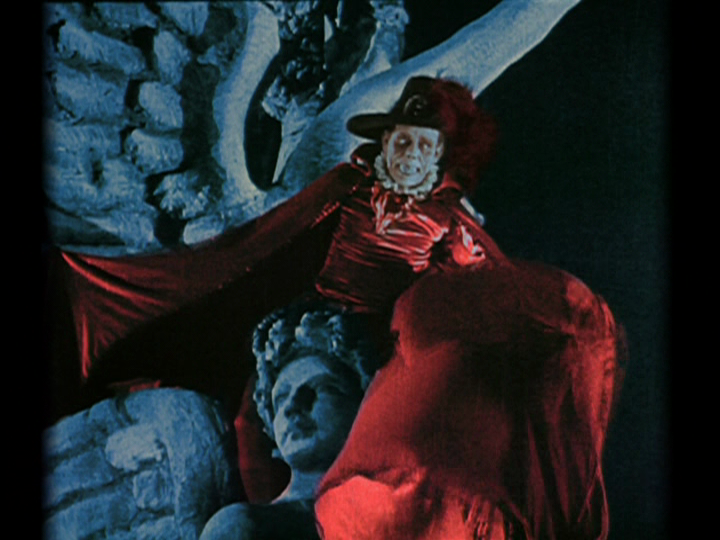 Shepard took the Eastman Print and inserted the recovered Technicolor Bal Masque sequence for the B&W footage in the Eastman Print. The work dates from 1990 but has been tinkered with since then. Brownlow's version dates from 1996 and in addition to substituting the Technicolor footage, makes other changes. 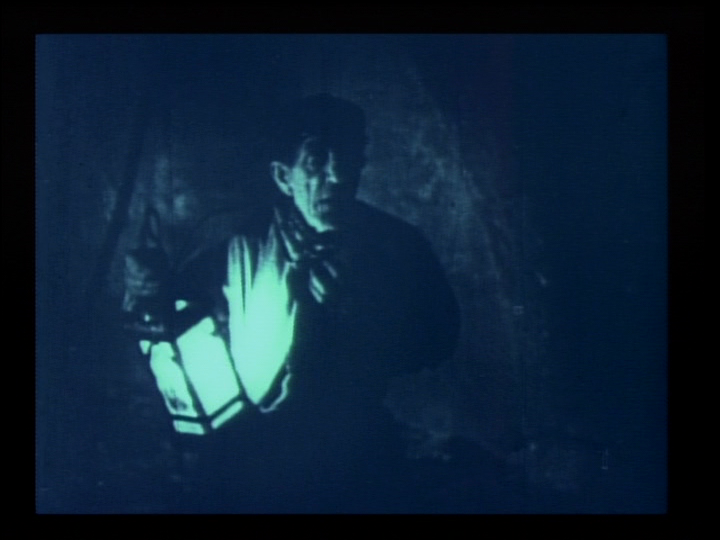 First, the Man with a Lantern and the closing cast credits are excised completely from this version. 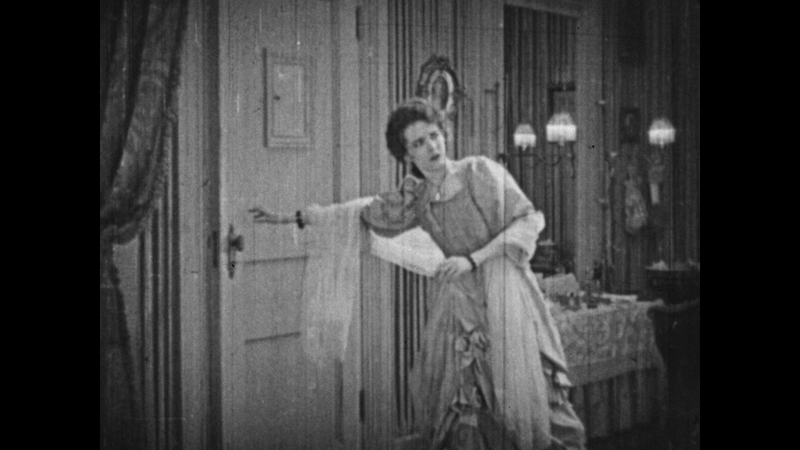 The justification for the first edit was likely that the sequence was superfluous to a silent film and would be puzzling for a modern audience. The second edit was done because the credits mistakenly credit Virginia Pearson as Carlotta when she was re-cast as Carlotta's mother. This version was broadcast to great fanfare on Channel 4 in the U.K. that same year and the general public would not be familiar with the issues surrounding this footage. Second, the Handschiegl effect on the Phantom's cape has been simulated using computer colorization. Third, the Bal Masque sequences after Christine and Raoul have descended from the roof have been computer colorized to approximate the two-color Technicolor look, even though the Technicolor film would have used different shots. Fourth, for the nitrate-decomposition affected scenes set in Christine's intended bedroom in the Phantom's lair, footage from the 16mm Hampton Print was substituted as it does not demonstrate the heavy mottling captured in the Eastman Print. 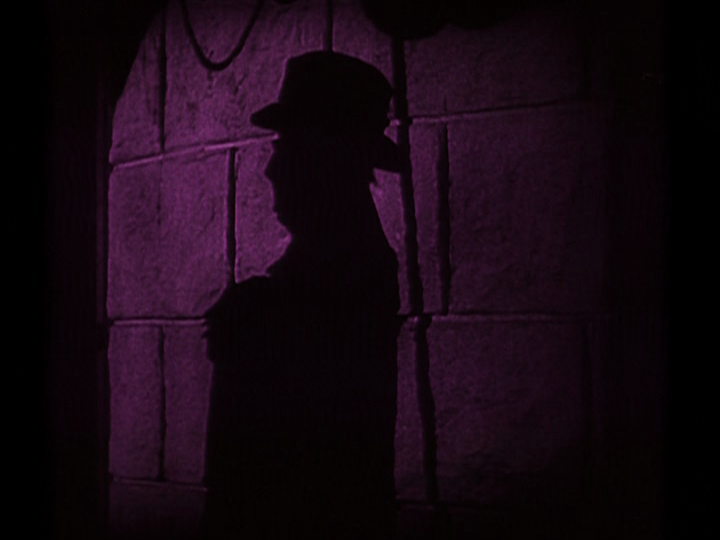 Shepard's version would eventually follow Brownlow's in part on the Blu-ray by recreating the Handschiegl effect on the Phantom's cape and in the Torture Chamber. The tinting schemes used by both versions have substantial differences, as described below. 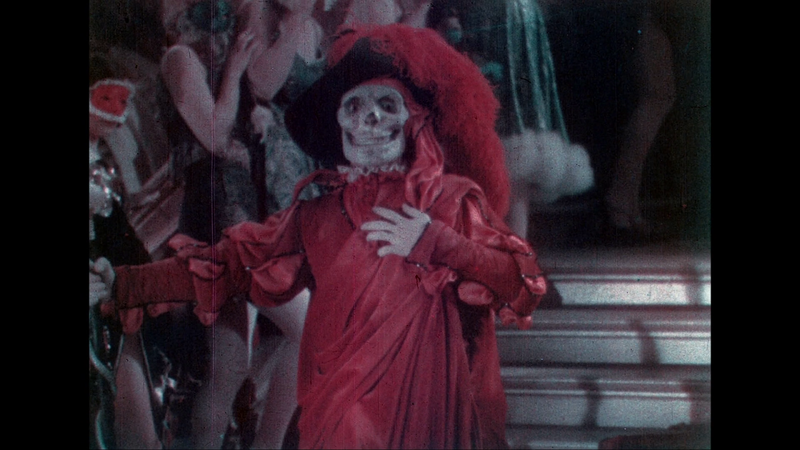 In their presentations of the Eastman Print, both versions leave out the B&W variation of the Technicolor Bal Masque Sequence. The main score for the Shepard editions is from French-Canadian composer Gabriel Thibaudeau and composed in 1992, while British composer Carl Davis performed the honors for the Brownlow version in 1996. If one of these composers is identified in the version you are watching, you know from which pedigree your version comes from. Shepard's version has been officially released on five occasions on an optical disc format, on Laserdisc in 1990, on Laserdisc and DVD in 1997 and on Blu-ray in 2011, all by Image Entertainment, and in 2015 by Kino International. Brownlow's version has been released twice, first by Milestone Film (distributed by Image) in 2003 and by the BFI in 2013. The 1997 DVD and BFI discs are region free, the 2003 DVD is Region 1 and the 2011 and 2015 Blu-rays are Region A. The 1997 DVD and the latest Blu-rays are all still in print or easily available. All releases are single disc unless otherwise stated. This version runs the Eastman Print at 24fps with the Gaylord Carter Organ Score (probably the same recording as on the Image Blu-ray), but also includes the Hampton Print as an extra without a score. It contains the 1925 Trailer. This disc has long since been superseded. This version runs the Eastman Print at 20fps with the Thibeadeau score but only includes some scenes from the Hampton Print not included in the Eastman Print. It also includes the 1925 Trailer and an essay. This may have been the first silent film to be released on DVD. This two-disc version runs the Eastman and Hampton Prints at 20fps. The Hampton Print is accompanied by a score from Jon C. Mirsalis. It contains the 1925 and 1929 Trailers, the latter with sound from the Talkie re-release discs, a video interview with Carla Laemmle and an audio archival interview with cameraman Charles Van Enger, still reconstructions of the Los Angeles Preview and San Francisco World Premiere versions, an extract of Faust from the 1929 feature Tiffany, nine dialogue selections from the Talkie re-release discs, the soundtrack from the talkie re-release edited to the Eastman Print, audio commentary by Scott MacQueen. The only major film sequence missing and available at the time of this release was the Man with a Lantern from the Eastman Print. The Eastman Print exhibited here has a problem with ghosting and motion artifacts believed to be the result of an improper PAL to NTSC transfer. While this DVD is long out of print, it contains many extras not found elsewhere. This four disc set offers the Eastman Print with the Technicolor Bal Masque sequence and the Eastman Print with the B&W Bal Masque sequence. It also offers the Hampton Print with the Technicolor Bal Masque sequence. The score included is an organ score from Lee Erwin and a voice for the Man with a Lantern by John Griggs. The print scanned for the Eastman Print is 16mm reduction. Its features include a "widescreen" side by side comparison of the Eastman and Hampton Prints and the Technicolor and B&W Bal Masque sequences. This Blu-ray disc contains two HD versions of the Eastman Print. One version runs the film at a progressive 24fps at 1080p and shows noticeably less print damage. The other version runs the film at 20fps. Since Blu-ray spec only officially supports progressive frame rates at 24p or 23.976p, the 20fps version uses a 1080/29.97i resolution and telecine pulldown to support the unusual frame rate. A score from the Alloy Orchestra or the Gaylord Carter Organ score can be selected for the 24p version. The Carter score was composed in the 1970s and is synchronized to the film running at 24fps. o stands for odd, e stands for even and the highlighted pair are the dirty frames. The Thibaudeau score or an audio commentary from Jon C. Mirsalis can be selected for the 20fps version. This Blu-ray contains a tinted version of the Hampton Print, but it is presented in Standard Definition NTSC resolution (720x480) only. It is accompanied by a piano score from Frederick Hodges. The 1925 Trailer is included and an interview with composer Thibeadeau, both also in SD. The Fifth Revised Shooting Script and Souvenir Program are also included as a succession of still images. The contents of this disc were released by Park Circus in the U.K. on a Region B disc. The first pressing of this disc had a non-intuitive menu where you could only select the versions of the prints you wanted to watch by selecting the score attached to that version. To change to another version you had to eject and reinsert the disc or jump ahead to the end. Also, all stereo scores were output in mono and the Carter score was out of sync for Reel 1. The ballet dancers in the first ballet sequence also appear to be moving in slow motion in both the 24 and 20fps versions. A replacement disc fixes the stereo/mono issue and uses a new, more intuitive and technically impressive menu. This package contains one Blu-ray disc and two DVDs. Although this post and blog is written from the perspective of someone in the United States, I am not adverse to including information about a new and substantial release. The Blu-ray disc and the two DVDs included are region free, but the DVDs are PAL and may not play in a U.S. player. The Blu-ray and the first DVD have identical content, with the Eastman and Hampton Prints and the extras, the second DVD just has the documentary Lon Chaney : A Thousand Faces. Both the Eastman and Hampton Prints are run at 20fps, but in both cases the 1080p/24fps mode is used on Blu-ray. This is a dual-format release, so the prints are presented on the Blu-ray and one of the DVDs. On the DVDs, all video is shown at the 50i PAL standard. The film is sped up 4% as a result, but the audio is pitch corrected. This means that one out of every five frames is repeated to make up the missing 4fps. The Hampton Print is in HD, unlike the Image Blu-ray, but is not tinted. The Technicolor Bal Masque sequence in the Eastman Print is windowboxed, as is the sequence where they used a 16mm print for the scene with Christine in the boudoir, presumably to match the Movietone-like aspect ratio of the rest of the Eastman Print. The shots of the Phantom on the roof with the Handscliegl effect applied are cropped and somewhat grainier than the rest of the film. The BFI Eastman Print is based on the 1996 Brownlow restoration. This restoration was done at standard definition at the PAL format. 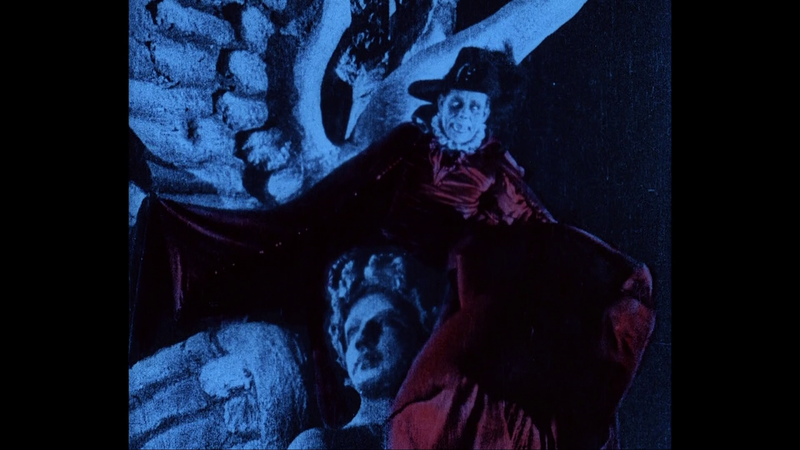 For those sequences where the 16mm Hampton Print is used to replace the damaged scene with Christine in her bedroom in the Phantom's lair, the three color titles at the Bal Masque, the Handscliegl process on the Phantom's cape and the colorized portion of the Bal Masque, all these sequences have been upconverted from SD materials. The two trailers are included, and the recently discovered material from Reel 5 of the 1929 Talkie Re-release is included synchronized with its sound disc. The Man with a Lantern from the Eastman Print is included as an extra, the sequence remains excised from the main presentation. All video footage on the Blu-ray is presented in HD, scanned at 2K. The DVD uses the same scans, downscaled from HD into SD PAL. The short sequence of the Man with a Lantern from the Hampton print is deleted in this version. Also, the closing credits card in the Eastman Print for the cast is deleted. The second DVD contains the documentary Lon Chaney: A Thousand Faces, first broadcast for Turner Classic Movies in 2000. It is directed by Kevin Brownlow and narrated by Kenneth Branagh. A booklet accompanies the discs describing the production and restoration of the film. This Blu-ray is something like a re-issue of the now out of print Image Blu-ray, but comes on two Blu-rays. A DVD version is also available. The first Blu-ray has 24fps and 20fps versions of the Eastman Print like the Image Blu-ray, but nothing else. The 20fps version is now using the 24p progressive frame rate supported by the Blu-ray format. The 20fps version also appears to have been noticeably cleaned up compared to the Image Blu-ray and even the 24fps version has minor improvements and corrects tinting errors. Because these versions share a dual-layered disc, their bitrates are higher than the older Image versions. The 2015 20fps version is displayed progressively at 24p (or 23.976p). In order to do this, every fifth frame is repeated once to make up the extra 4 frames needed by the format. The reason this is done for this and many other silent films is because the Blu-ray format does not officially recognize any other progressive frame rate except for 59.94p at 1280x720. The 24fps version on the Image and Kino Blu-rays came from Paul Killiam's film collection. Killiam was a comedian in vogue in the 1950s who did much to help preserve silent film. His print was duplicated directly from the Eastman Print and I believe eventually found its way into David Sherpard's Blackhawk Film archive. The 20fps version on the Kino Blu-ray is a slowed down version of Killiam's print. 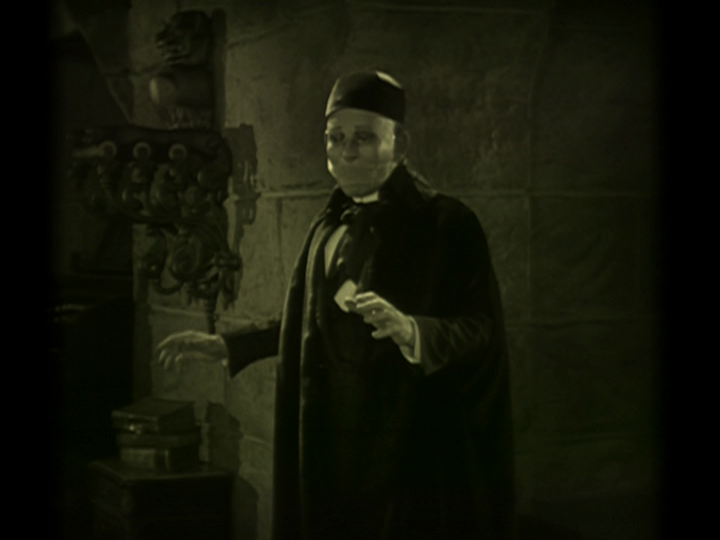 The old 20fps version on the Image Blu-ray was duplicated from Killiam's copy, making it as a source a generation further away from the Eastman Print. This is one reason why it looks rather rough. Neither version on the Kino disc shows the tint colors in the pillarboxes on the sides of the video, which was a flaw on the Image Blu-ray. There was a sychronization issue with the Thibedeau score on the Image Blu-ray which was mostly fixed on the Kino Blu-ray. The only issue that was not fixed was the slow motion ballerinas. The ballerina sequence at the beginning of the film was stretch printed on the print Image and Kino used. Stretch printing slow downs the action shown on film by duplicating frames when prints are made. Fortunately this issue lasts only for a minute or two (3:04 to 4:42 on the Kino 20fps version for example) and does not affect any other portion of the film. I think the ballet music used in this scene goes on for too long and spills into the next scene. The Alloy Orchestra's score on the 24fps version is much better timed to the action. Unfortunately, the Carter score on the 24fps version is totally out of sync for the first 11 minutes of the film. The correct music plays about a minute and a forty-five seconds later than it should. The music for the ballerinas start to play at the end of the next scene with the managers. This sync issue may have occurred on the first version of the Image Blu-ray but did not on the second. All the extras and the Hampton print are on the second Blu-ray disc, which is also dual layered. The extras are mostly the same as on the Image Blu-ray with three extras. The Hampton Print is now in 1080i, but it is an upscaled version of the 480i version found on the Image Blu-ray. However, it is better to have the upscaling done by professional software instead of the Blu-ray player or the TV, and the film uses much more of the disc on the Kino than the Image. Essentially, if the old Image disc is version 1.0, the newer image disc is version 2.0, then the Kino disc is essentially version 3.0. All discs except for the 1990 Laserdisc have a speed-corrected transfer of the film to 20 frames per second. except where specified as running at 24 frames per second. 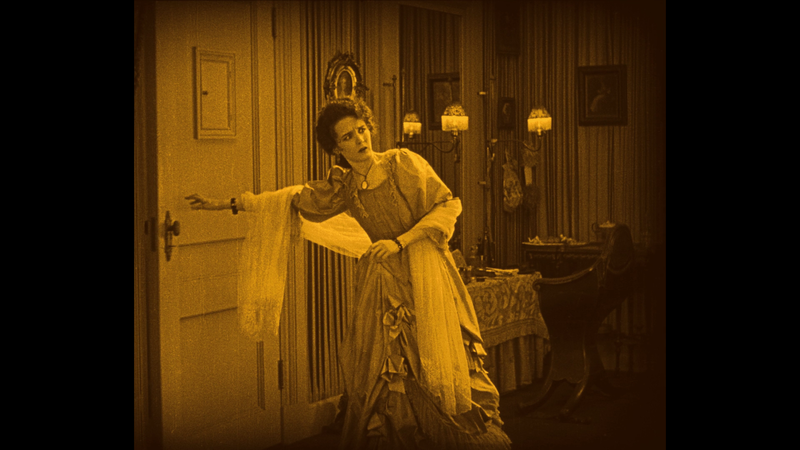 Sound films use 24 frames per seconds, but silent films generally were projected at 16-22 frames per second. Milestone's Eastman Print has a serious issue with ghosting and jittery movement, probably due to frame rate differences between the PAL video master and its conversion to NTSC video. Image's Blu-ray versions suffer from some unnatural slowdown during the opening ballet sequences and speedup in the first scene in the manager's office, but are otherwise without motion issues (unless they are in the original print). As befitting Blu-ray, the Eastman Print on either disc looks much sharper than any DVD or Laserdisc due to the high definition transfer. One example of this is that it is easy to identify in which shots (except for long shots) Chaney is wearing his mask with painted on eyes and which shots he is using a different mask with cutouts for his eyes. However, sometimes the focus is soft, so you should not expect razor sharp clarity in every frame. As has been noted by others, the Image 24fps version had some amount of post-processing work done to reduce the scratches and wear on the print. However, no attempt was made on either Image version to remove large hairs that pop in the edges of the frame, large scratches or a broken film perforation fragment which appears as Christine meets the Phantom for the first time. People have stated that the Image 20fps version, while looking more worn, also looks more natural and less processed. Milestone and BFI seem to have made attempts to clean up their video presentation of the major blemishes and scratches. There is no broken film perforations in these versions. Milestone and BFI substituted 16mm footage from the Hampton print for most of the scene where Christine is in her room in the Phantom's lair. This was due to the nitrate decomposition damage already present on the Eastman Print. Image DVD and Blu-ray used the 35mm footage instead. The 35mm footage here is not as sharp or clear due to the mottling, but still sharper and has better continuity with the 35mm footage preceding and following it. Image Laserdisc, DVD and Blu-ray have the Man with a Lantern sequence, Milestone does not and BFI has it as an untinted extra. When Photoplay Productions created the video broadcast master used by Channel Four, Photoplay or Channel Four must have deleted it as it would be baffling to the uninformed viewer. Image also has the cast credits at the end of its Eastman Print, Milestone and BFI do not. Image Laserdisc, DVD and Blu-ray have no Technicolor footage after the scene on the roof of the opera. The footage is tinted. 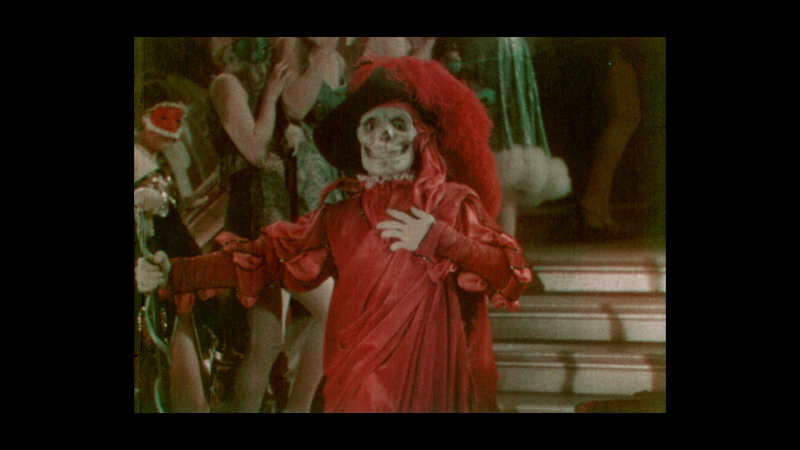 Milestone and BFI has colorized all the footage of the Bal Masque occuring after the scene. Image Blu-ray recreated the Handschiegl process for the face of the Rat catcher and to visualize the heat in the torture chamber. While I was previously aware of the possibility of some Handschiegl work for the rat catcher's scarf, I was not aware that there was the possibility of the Handschiegl process being used for his face or the torture chamber. Both recreate the process for the Phantom's costume when he is on the roof, but the result is noticeably different. Milestone's left border is fuzzy, but Image's is sharper. Image's may have a sliver less of information in the video frame as a result. The BFI has a sharp border and a sliver more information than Image. 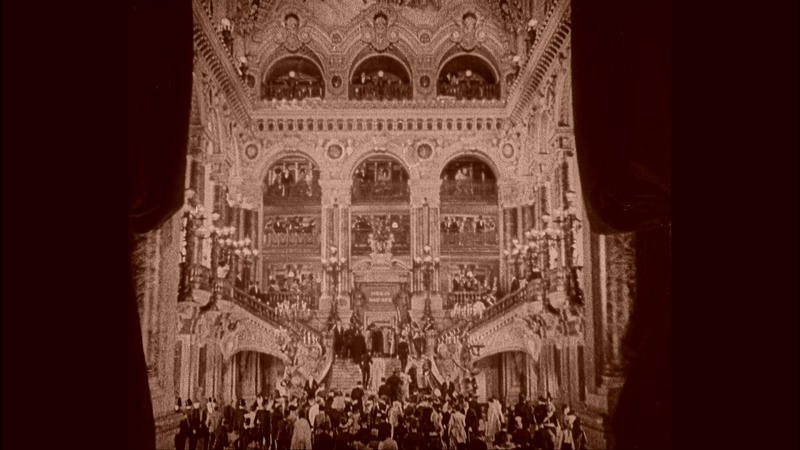 The Technicolor footage of the Bal Masque came from a different source and will be in a true 1.33:1 ratio. While the tinting is the same color on the Image 24fps and 20fps there are fluctions in the saturation levels between the two prints in some scenes. 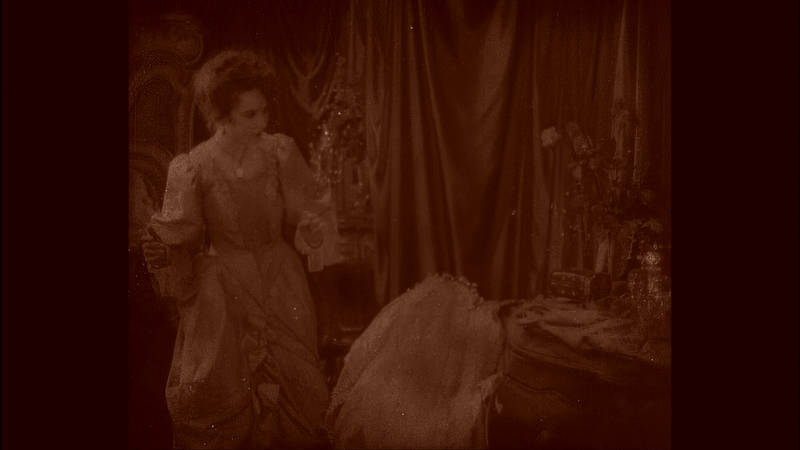 The scene where we first encounter Florine Papillon, Snitz Edwards' character, is very orange in the 24fps and much more sepia in the 20fps. 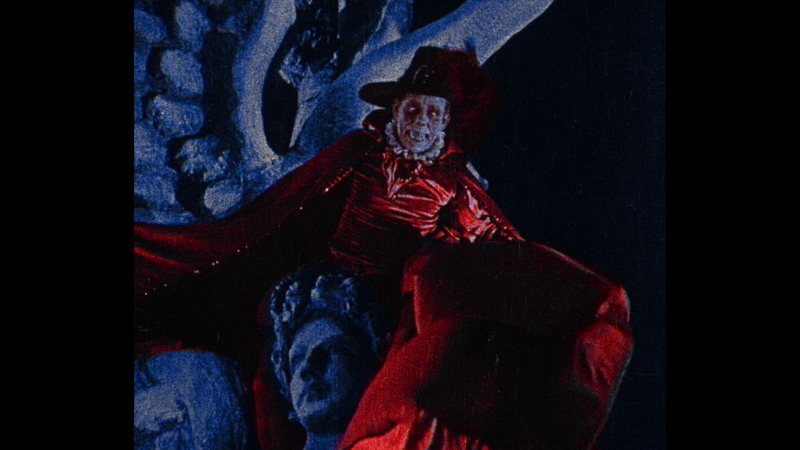 The BFI Blu-ray tints are often extremely saturated, especially the blue for night scenes and the purple for opera cellar scenes. There is a frame rate issue inherent in the Eastman Print. 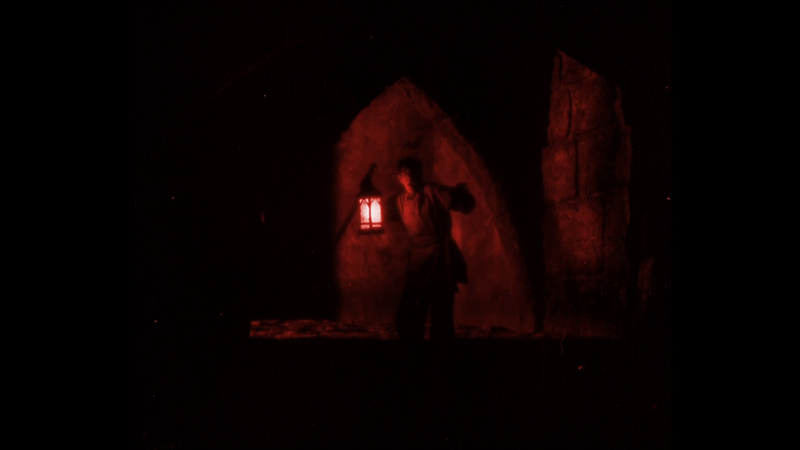 The vast majority of the footage was shot in 1925 at silent speed. This should be projected correctly at 20fps. The footage shot in 1929 would have been shot in sound speed. This means that the Opening Titles (where the phantom is skulking in the frame), The Man with a Lantern scene and the shots of Mary Fabian as Carlotta singing should be ideally projected at 24fps (especially for the latter if it is to be synchronized to the existing audio. The shots where Christine is singing just before she is abducted by the Phantom may also be from 1929. The BFI handles this by running these sequences at a true 24 frames per second while running the rest of the film at 20 frames per second. Milestone is a straight black and white presentation of a show-at-home print. Previously this version existed on the 1990 Laserdisc and really poor public domain releases. I would advise lowering the contrast a bit when watching it. There are combing artifacts due to the interlacing. Image apparently added tints to their presentation. Universal would probably not have gone to the extra expense of tinting 16mm inexpensive show at home prints. Both Milestone and Image are in standard definition. 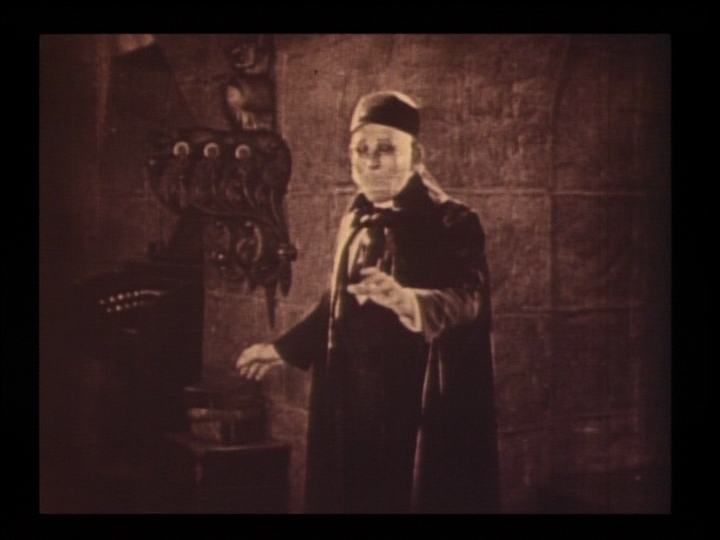 Despite what the back of the Image Blu-ray case says, they used a 16mm source for the 1925 version. (I am not even sure if motion picture film exists in a "6mm" gauge.) In my opinion, Milestone boasts a slightly sharper image due to the lack of tinting (see below for more detail). BFI's Hampton Print is in high definition, and the image quality is far superior to either Milestone or Image. It also shows more of frame than Milestone. Even the BFI's DVD has superior image quality to anything released before this. 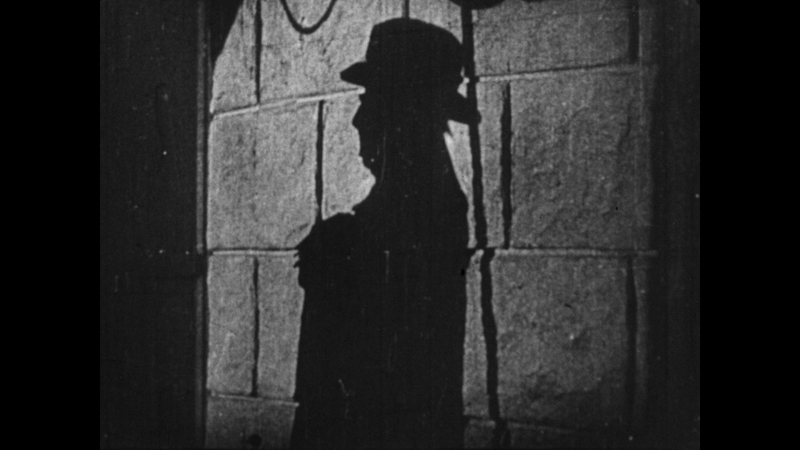 Unfortunately, the Man with a Lantern is excised from this version and two of the title credits "freeze" the image weirdly for several seconds, probably to keep the score in sync (the Man with a Lantern sequence takes a few seconds). 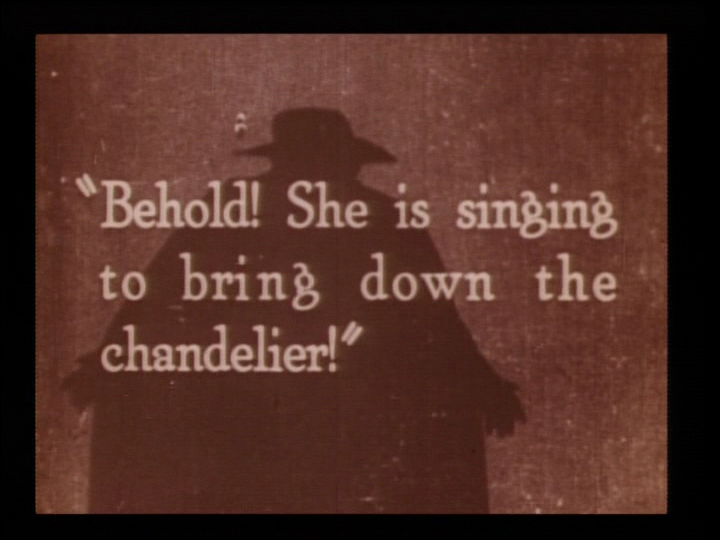 This also happens on two intertitles during the scenes where Christine is meeting the Phantom for the first time. This was probably done to ease the transition between print changes. (Several prints were used to make up the Hampton version). This is an orchestral score performed with the City of Prague Philharmonic in 1996. Davis has had a long history composing scores for films both silent and sound and for television. Score is in stereo. In this version, the producers have tried to match the sound disks for the Talkie Re-release as best they could to the action on-screen. There is music playing throughout the film as composed or compiled in 1929 and there is voice acting roughly at places where it should be. The intertitles are still shown of course. While PowerDVD reports this track as being in stereo, the soundtrack is obviously monaural. One issue to note is that the film which this track accompanies is being projected at 20fps, but the dialogue and music for the talking version was recorded at 24fps. This means that the music and dialogue is being played back at a 20% slower speed than it should be playing. It sounds a bit creakier than it should. MacQueen's commentary shows that he is an authority on the film. Its very entertaining to listen to and possesses a nearly encyclopedic knowledge of the film's production. 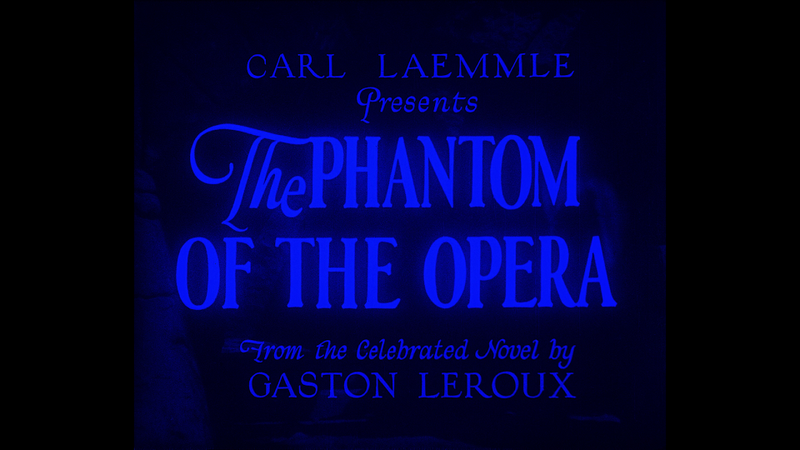 He tells the story of Phantom from its beginnings in Gaston Leroux's novel through the 1925 and 1929 versions, interrupting to comment when something is on the screen. He was primarily responsible for the 1929 soundtrack. This is the same individual who did the commentary on the Image. His website is http://www.lonchaney.org/. 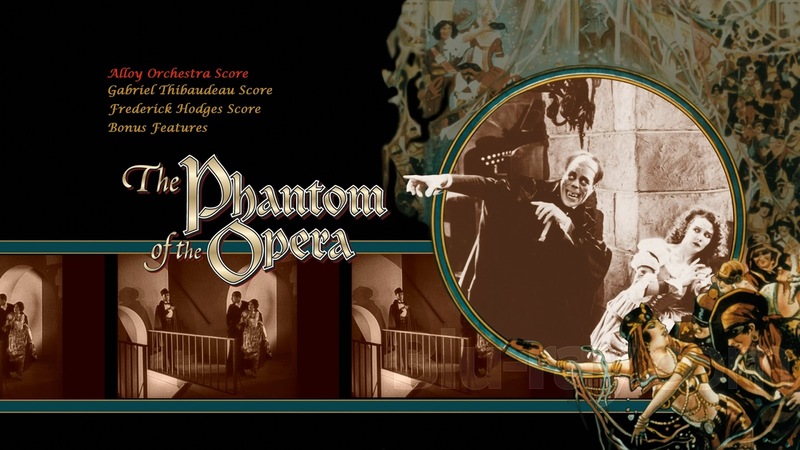 My favorite score for the 1925 version of the film and is tied with the Carter/Killiam score for my all-time favorite score for Phantom. Unfortunately, Image's scores can be heard only with their respective versions. The scores offered for the 24fps version cannot be heard with the 20fps version and vice versa. This is due to the fact that these scores and commentary were intended for a particular running time. The 24fps version runs 77 minutes long, the 20fps version 91 minutes. The 1925 version of the film runs for 124 minutes. The Alloy Orchestra is a trio of artists who specialize in composing scores for silent films. They are based in Cambridge, Massachusetts. I have listened to some of it, and its a bit too modern for my taste in silent music scores. Their website is http://www.alloyorchestra.com/. They use synthesizer keyboards, musical saw, clarinet, accordion, banjo and what they call "junk percussion". Score is in stereo. Composed and performed by Gaylord Carter in 1974. Carter's career began in the early 1920s, accompanying silent pictures with his theater organ. He was able to find work with sound films, radio and television and performed into the 1990s. In the 70s he scored many silent pictures released by Paul Killiam's Film Classics. Score is in stereo. The credits for Image indicate that Carter was actually playing at the organ. The version I grew up with from Killiam's Film Classics gave credit to Richard Simonton for Theater Organ. Was Simonton the organist or the provider of the organ? Image uses a different recording that Carter made for Blackhawk Films instead of the one he made for Killiam. This score was composed in 1992 with the I Musici de Montreal and included vocals from a female soprano. Personally I am not a fan of it. This is the score also found on the 1997 Image DVD. Score is in stereo. 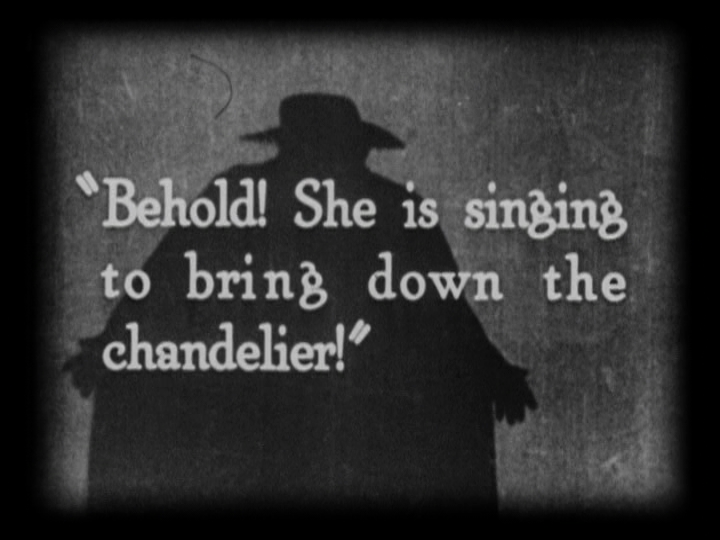 Mirsalis is an unapologetic admirer of Lon Chaney. 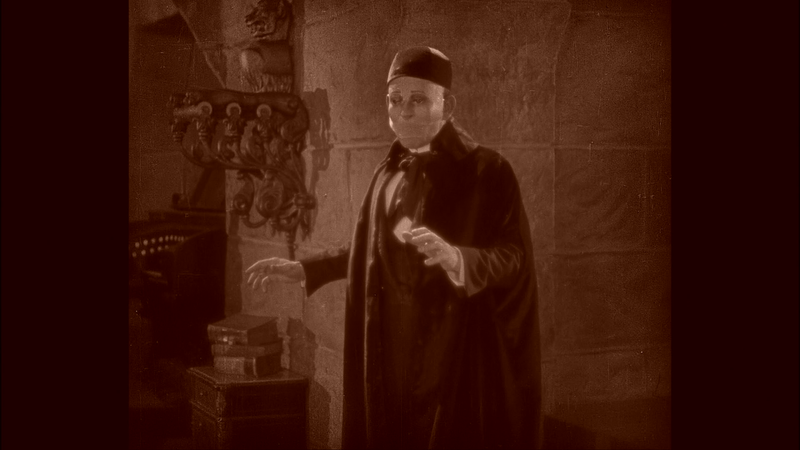 The longer his commentary goes on, the more it focuses on Chaney's life and career and less on the film. It is a nice complement to MacQueen's commentary. He almost certainly makes an error when he states that the General Release version premiered in San Francisco in September, 1925. It premiered in New York City. He also makes some unwarranted speculation that the Bal Masque sequence may have been shot in Prizmacolor. There is no substantial doubt that it was shot in two-strip Technicolor. This score was commissioned specifically for Image. Score is in stereo. This score was commissioned specifically for BFI. Score is in stereo. Neither the Image or BFI piano scores for the Hampton Print come close to Mirsalis' score, in my opinion, on the Milestone disc. Untinted, silent, has few extra seconds compared with Image. Has synchronized soundtrack, tinted in sepia. In the Box 12 excerpt, the managers speak to the maid, enter the box to find the Phantom, exit and talk to the maid again, enter to put the Phantom out, but when they find the box empty, they exit and tell the maid to tell no one. This takes approximately 2 minutes to accomplish at sound speed. 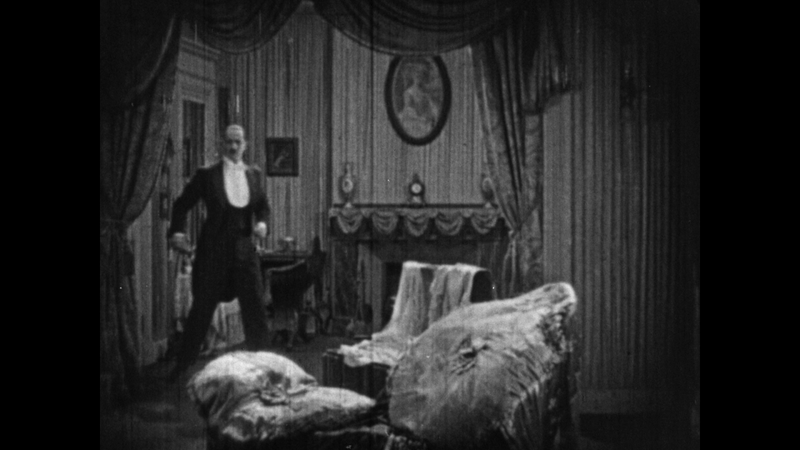 In the silent version, the managers only speak to the maid once and are able to finish the scene in 1 minute, 40 seconds at silent speed. Carla Laemmle was the niece of Carl Laemmle Sr., the President of Universal Studios. 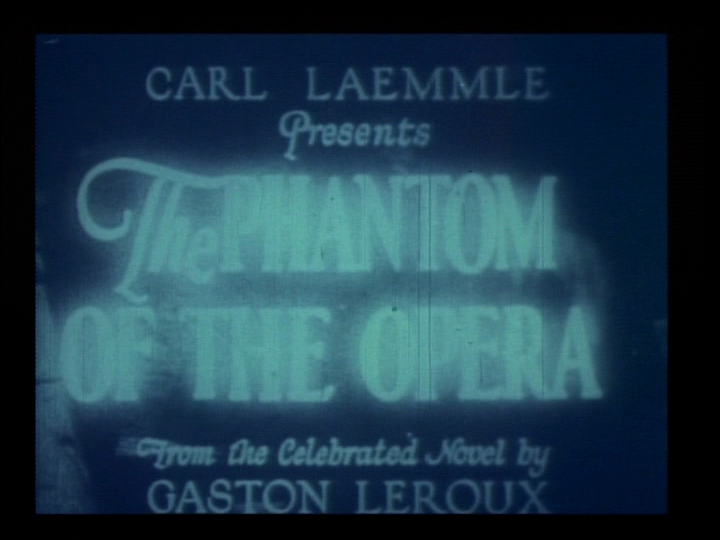 Laemmle put his relatives on the payroll, and Carla played the part of head ballerina in Phantom. She also plays a passenger in the coach in the opening scene of Universal's 1931 production of Dracula. Her interviewer is David J. Skal, a noted researcher into Universal's horror films of the 30s and 40s. He has written several books on the subject of horror films. 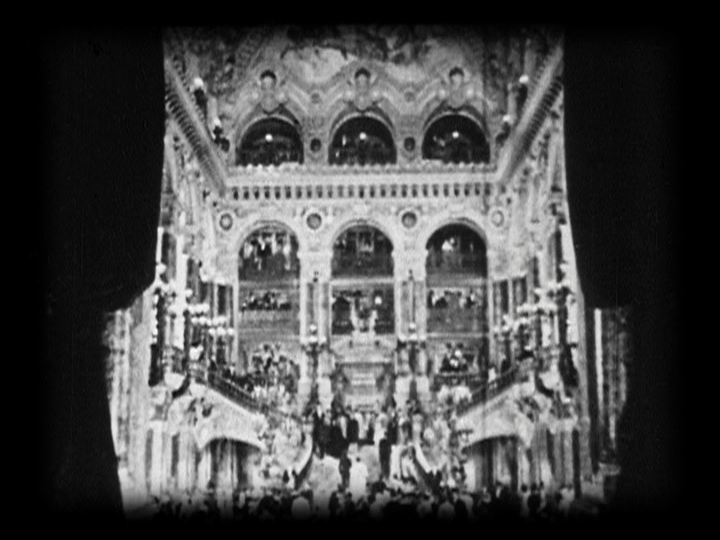 Contemporary footage of a the 1929 film Midstream which features Charles Gounod's opera Faust, which is so prominently featured in Phantom. It gives you an idea what 1929's sound technology could do when am opera scene needed to be filmed. This interview was recorded on July 29, 1973. Enger was the principal cameraman on Phantom and the interviewer was Richard Koszarski. He had a low opinion of Director Rupert Julian and respected Lon Chaney. This interview was done for a PBS station and reveals that Thibeadeau enjoys accompanying screenings of silent music with a piano. Unlike Milestone, the stills on this disc are not given a submenu where they are broken down by categories. Some stills are very sharp, others look like they were scanned from a book. Tinted in blue and purple, uses Hodges piano score for music. Missing ending shot of crowd outside Astor Theater. Presented identically to the script. A Blu-ray's zoom function is useful here. 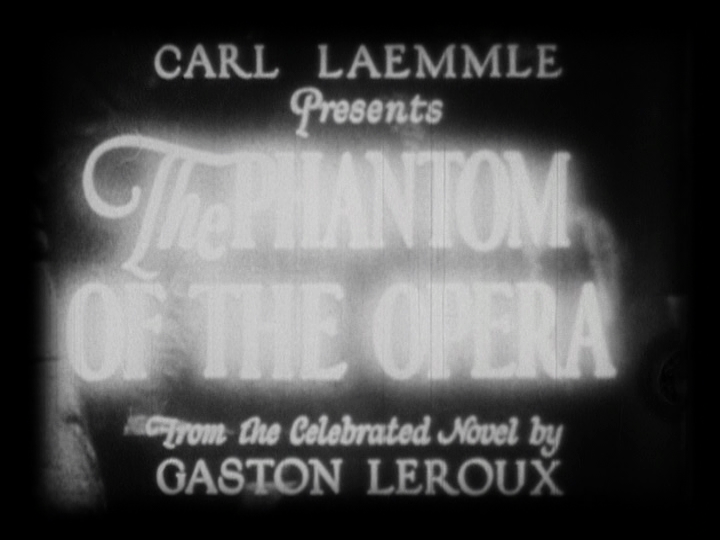 No tint, uses 1929 Title Card (with the title merging to the center). Uses 20 frames per second within 24p on Blu-ray. Interestingly, you can see in this extra what the title card looked like without the cropping of the Eastman Print. Sepia tinted, uses 24 true frames per second speed. The music comes from the Talkie Re-release discs, but is different than the same trailer on the Milestone. No tint for the footage that comes from the true Reel 5, Sepia tinted for scenes taken from the Eastman Print to complete the reel. There are two places where the frame goes black for a second or two, one of these is where Christine speaks the line "Oh my, I'm afraid." The Phantom's servant can be seen clearly speaking the line "Come through the mirror, have no fear." 24 true frames per second on Blu-ray. No tint, 24 true frames per second on Blu-ray. This is included as a PDF file on the first DVD. This programme was issued to theatre patrons when the 1996 Brownlow restoration premiered theatrically in London in 1926. It gives the history of the production, the restoration, biographical summaries of Chaney, Julian, Philbin, Kerry and discusses the Davis score. On the second DVD, first broadcast by Turner Classic Movies in 2000, an 86-minute documentary on the life and films of the great actor. PAL Format. As this documentary was produced by Kevin Brownlow in the U.K., the 25fps PAL format is not an inappropriate video standard. This booklet contains articles from Kevin Brownlow, Patrick Stanbury and Geoff Brown describing their experiences with the Phantom. There is also a description of the features of the discs and production credits for the film and the Chaney documentary. Finally, there is technical details about the transfer. See description for the Image disc above, upscaled to HD. This is the fifth revised shooting script, although this version is presented as scrolling text set to the Thibeadeau score. Two travelogues by Burton Holmes depicting Paris in 1925, Paris from a Motor and A Trip on the Seine. I am not sure how relevant this is supposed to be for a movie set closer to 1885 than 1925, but movie cameras were still being invented in 1885! This contains a shortened version of the film in HD running 53 minutes and using a fair amount of the existing audio from the 1929 Talkie Disks. 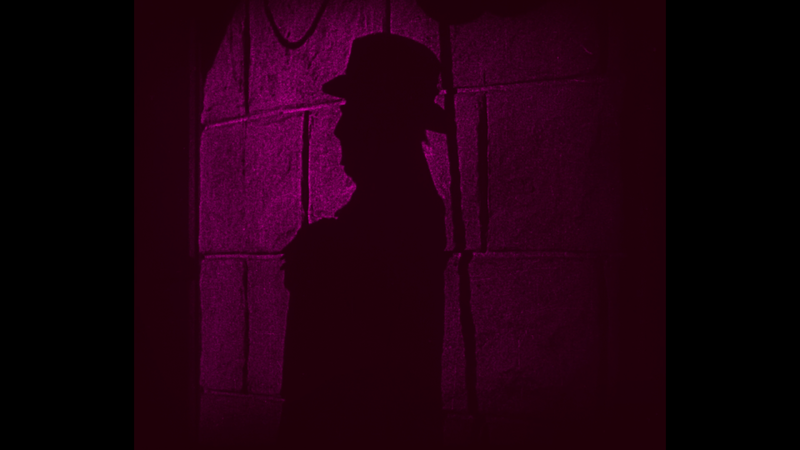 This is superimposed over the Eastman Print footage and the recently found Reel 5 of the 1929 Talkie version. When there is dialogue with no corresponding film, there will be a black screen with explanatory text. This is similar to how it was presented on the Milestone DVD, but the Milestone DVD provided the whole film with the soundtrack, it was not truncated as it is on the Kino Blu-ray. The Milestone DVD has all the talking scenes from the 1929 Talkie Disks available to be heard individually, the Kino Blu-ray does not present all the audio or the talking scenes. Brownlow is more consistent with its tinting than Shepard. All outside evening scenes are blue and all opera cellar scenes are purple with only one exception for each. 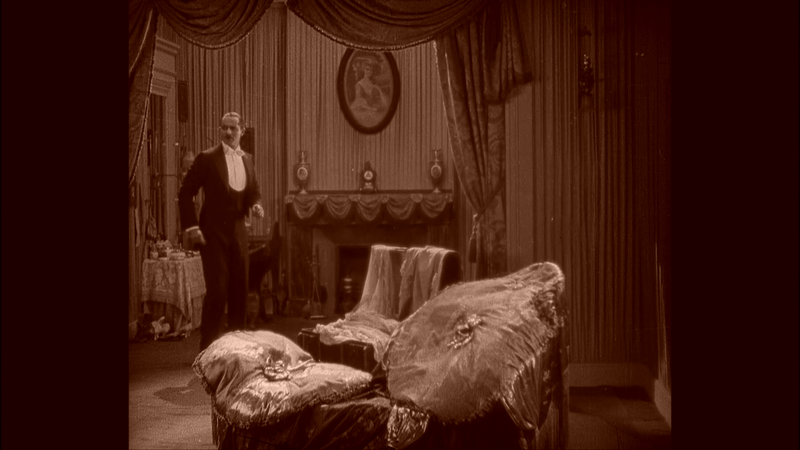 Indoor scenes are sepia with the exception of the ballet and the phantom's lair. Beginning credits and end title are blue. 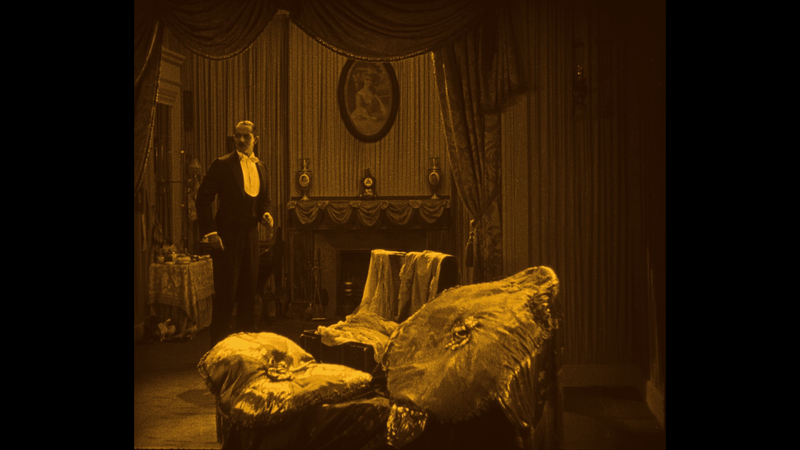 The green in the Phantom's Lair scenes is so light as to easily confuse it for not being colorized at all. 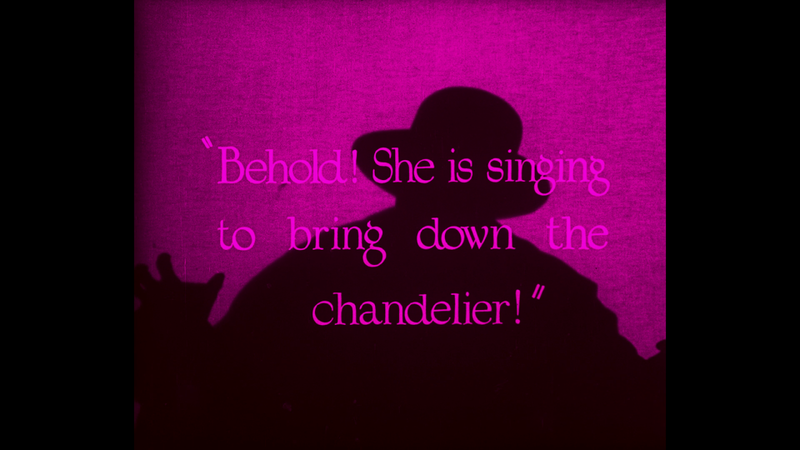 Apparently the different tints in the rooftop scene may have been original to the print, as it is the only scene where the intertitles are a different color than the action and all the speakers are in the same room (contrast to Christine and the Phantom talking to her behind the mirror when she is in her room). Brownlow is very consistent in tinting with the Paul Killiam Film Classics version I grew up with. The Killiam Eastman Print has a restoration credit to Paul Malkames. Malkemes was a noted film preservationist who helped preserve dozens of silent films and some early sound films like the 70mm version of The Big Trail, which is notable as being an early sound film shot in widescreen, on large gauge film and John Wayne's first starring role. Malkemes was an expert in silent film cinematography and well-qualified to judge tint. His tinting is very simple, blue for outside the opera, sepia for rooms and offices, purple for the opera stage and cellars (initially) and green for anything having the phantom in it and the cellars after Christine's abduction from the stage. Shepard's tinting takes a more dynamic approach at times, although there is more sepia than in Brownlow's. In both restorations we are faced with the respective restorer's choices regarding tinting. The major choices are at least fifteen years old for both. However, there are obvious errors in the Shepard versions as two intertitles and one short scene identified in above are not tinted and seemingly should be. I would love to know the decisions behind each restorer's tinting choices. While the fifth revised shooting script contains tinting indications, this does not necessarily mean they were followed through to the General Release. The fifth revised shooting script's tints are very simple, blue for nighttime outdoors, amber for the grand staircase, opera stage and boxes, office and dressing rooms and the Phantom's lair, green for the cellars and a little red in the torture chamber. The Image Blu-ray Hampton Print seems like someone started to tint the film but did not finish. Virtually all the film is in sepia or in a bluish white that barely looks like tint at all. 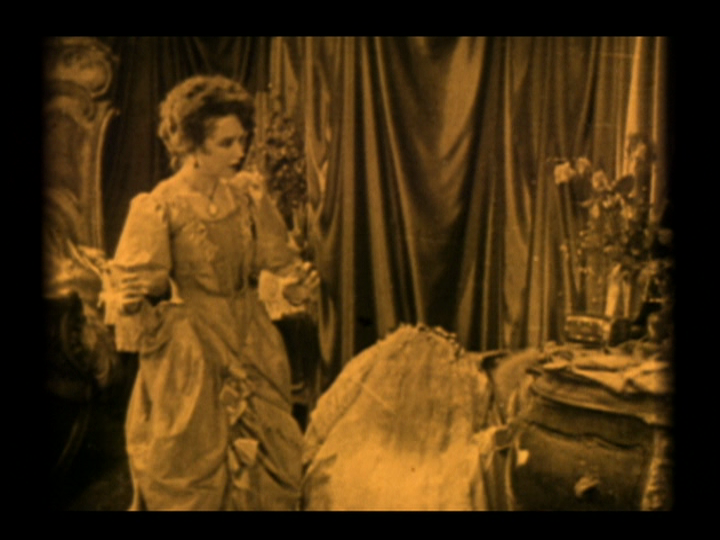 With sepia scenes, the color occasionally flickers to purple or red. There are very few indications that someone made a defensible choice of tinting. Interestingly, the switch to green when Christine pulls the mask off the Phantom's face is the only time where an intentional choice appears to have been made, but one I have never seen in any other print or version of the film. Considering the standard resolution of the film, the tinting makes it slightly harder to distinguish detail. In an era of high definition televisions and Blu-ray players, Phantom is well-served with two quality, accessible releases that, between them, eliminate any need to keep DVDs, except for the extras on the Milestone. The 8-bit TMS9918 "Not Quite a Standard"